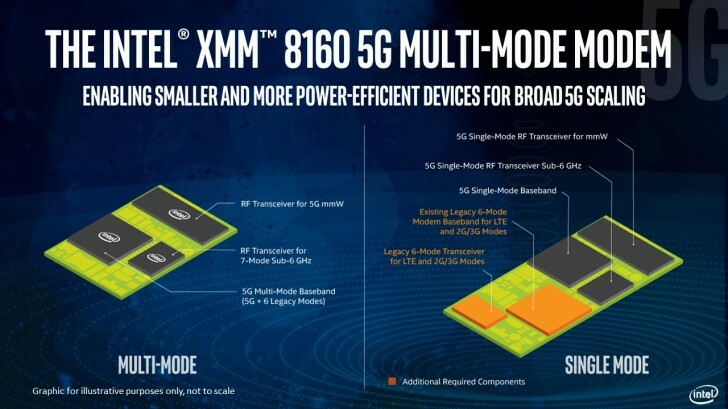 Intel unveiled the XMM 8160 – its first 5G modem. It’s a multimode modem so it supports the latest mmWave tech as well as older standards going all the way down to 2G. By having all this connectivity in one chip makers can simplify the motherboards of their phones, PCs and hotspots, Intel claims. The new modem will deliver peak speeds up to 6Gbps, three times faster than Intel’s latest LTE modems. It supports short range/high bandwidth mmWave, as well as the 5G NR from 600MHz to 6GHz (in both FDD and TDD flavors). The modem also supports EN-DC – a way for the modem to connect to 4G and 5G networks simultaneously. Network connectivity is controlled through the 4G network, the 5G jumps in for fast data transfers when needed. This is called a Non Stand Alone connection and will be vital during the 4G/5G transition. The modem supports Stand Alone connectivity as well. The reveal of the XMM 8160 was pulled forward by over six months. However, it won’t ship until the second half of 2019 and the first commercial products with it will hit the shelves in the first half of 2020. Apple ditched Qualcomm and used Intel modems this year. It’s not clear if the iPhone maker will go back to Intel for 2019, but it has plans to drop Intel by 2020. So, there won’t be any Intel-powered 5G iPhones. MediaTek wants to pick up the slack with its own 5G modem, which will be ready in time for the 2020 iPhones. Of course, Intel still has the PC market to look forward to, especially ultrabooks, 2-in-1s and Windows tablets.